Egypt's government failed to thwart protesters' planned "Friday of Wrath," as tens of thousands of anti-government demonstrators took to the streets in the morning and managed to chase police from the main square in Cairo by the end of the day. Throughout the day, demonstrators throughout the country wielding glass, rocks and sticks confronted police, who fired back with rubber bullets, tear gas and water cannons. President Hosni Mubarak, the focus of protestors' ire, has ordered a curfew to begin at 6 p.m. local time (11 a.m. EST.) However thousands of protestors remained in the streets as the curfew hour passed. Mubarak, who has been in power 30 years, has also reportedly ordered the deployment of the military to help quell protests and impose the curfew in Cairo, Suez and Alexandria for the first time since demonstrations began on Tuesday. At least one protestor was killed Friday, bringing the death toll of police and protestors to eight since clashes began throughout the country on Tuesday. There are some reports of additional police having been killed as well. Amid the unrest, Egyptian security officials said police have put Nobel Peace laureate and opposition figurehead Mohamed ElBaradei under house arrest. Police stationed outside his suburban Cairo home told him he cannot leave the house after he joined protesters in the capital Friday. While ElBaradei may represent longtime opposition to President Hosni Mubarak's 30-year authoritarian reign, the protestors appear to be currently led by no individual or group, especially in the face of a nationwide communication blackout, an eyewitness reports. Internet and cell phones were blocked throughout the country early in the morning, reports eyewitness Alex Ortiz. As a result, word of mouth has brought people of all ages and walks of life into the streets to protest Mubarak's rule. Large groups of protesters gathered in at least six venues in the Egyptian capital, Cairo, a city of about 18 million people, and many of them were on the move marching toward major squares and across Nile bridges. The protests largely began with small groups of demonstrators outside various mosques throughout Cairo following Friday morning prayers, Ortiz said. The many small protests soon converged and made their way downtown. By the end of the day, demonstrators had succeeded in driving police from Tharir Square in central Cairo, close to many government ministries and the site of the outbreak of demonstrations on Tuesday. Earlier in the day, Police had fired water cannons at ElBaradei and his supporters as they joined the latest wave of protests after noon prayers. Police also used batons to beat some of ElBaradei's supporters, who surrounded him to protect him. Live video streamed by Al Jazeera's English-language channel showed rock-throwing protesters on Cairo's October 6th Bridge driving back a police van, as tear gas canisters were fired at demonstrators. A soaking wet ElBaradei was briefly trapped inside a mosque while hundreds of riot police laid siege to it, firing tear gas in the streets around so no one could leave. The tear gas canisters set several cars ablaze outside the mosque, and several people fainted and suffered burns. "We are the ones who will bring change," said 21-year-old Ahmed Sharif, one of scores who were with ElBardei. "If we do nothing, things will get worse. Change must come," he screamed through a surgical mask he wore to ward off the tear gas. Abeer Ahmed, a 31-year-old woman who showed up for ElBaradei with her toddler, said she has a law degree but makes a living cleaning homes. "Nothing good is left in the country," she said. "Oppression is growing." Data services were disrupted across Egypt as authorities used extreme measures to try and hamper the protesters from organizing the type of mass rallies that have been seen all week - an unprecedented outpouring of public anger against President Hosni Mubarak, who has led the nation for more than 30 years. CNET.com reports the Internet-monitoring firm Renesys observed "the virtually simultaneous withdrawal of all routes to Egyptian networks in the Internet's global routing table." The anger behind this uprising is about many things: abuse, corruption and freedom of expression, but above all, it's about unemployment and the price of food, which has skyrocketed in a country where almost half the population lives on less than $2 a day, CBS News correspondent Elizabeth Palmer reports from Cairo. At the upscale Mohandiseen district, at least 10,000 people were marching toward the city center chanting, "Down, down with Mubarak." Palmer reported Friday morning for "The Early Show" from a vantage point looking over Cairo's central Tahrir Square, where thousands of protesters were expected to converge -- or at least try to converge. Palmer says the square was completely encircled by Egyptian special forces, and CBS was asked to move its camera position, out of view of the focal point of the protests. Regional television stations were reporting clashes between thousands of protesters and police in several other major Egyptian cities, including the Mediterranean port city of Alexandria, Minya and Assiut south of Cairo, and al-Arish in the Sinai Peninsula. The demonstrations are backed by both the country's biggest opposition group and newly-returned Nobel Peace laureate ElBaradei. In response to the threat of the largest protests to date on Friday, Egypt has apparently done what many technologists thought was unthinkable for any country with a major Internet economy: cutting itself off from the web to try and silence a protest movement taking inspiration from the ouster of Tunisia's president this month. Egypt's four primary Internet providers - Link Egypt, Vodafone/Raya, Telecom Egypt, Etisalat Misr - all stopped moving data in and out of the country at 12:34 a.m., according to a network security firm monitoring the traffic. Telecom experts said Egyptian authorities could have engineered the cutoff with a simple change to the instructions for the companies' networking equipment. "We are concerned that communication services, including the Internet, social media and even this tweet, are being blocked in Egypt," State Department spokesman P. J. Crowley said on Twitter. "We continue to urge authorities to show restraint and allow peaceful protests to occur." A Twitter message today from socialtechno read: "Thank you #egypt for showing why the US Congress wants an off switch for the Internet." A Facebook page run by protesters demanded of President Mubarak that he: declare that neither he nor his son will stand for next presidential elections; dissolve the parliament and hold new elections; end emergency laws giving police extensive powers of arrest and detention; release all prisoners including protesters and those who have been in jail for years without charge or trial; and immediately fire the interior minister. Mubarak, 82, has not been seen in public or heard from directly since the protests began Tuesday with tens of thousands marching in Cairo and a string of other cities. While he may still have a chance to ride out this latest challenge, his choices are limited, and all are likely to lead to a loosening of his grip on power. The state-controlled Al-Ahram newspaper, however, sought to project a notion of normalcy, reporting on its front page that Mubarak would open the city's annual book fair on Saturday. The government deployed an elite special operations force in Cairo on Thursday night as violence escalated outside the capital, and the Islamist Muslim Brotherhood called on its members to take to the streets after Friday afternoon prayers. Uniformed security forces at least temporarily disappeared from the streets of central Cairo mid-morning Friday, but truckloads of riot police and armored cars started moving back about an hour later. By late morning, thousands of black-clad riot police armed with batons and shields were deployed across the city, with the largest concentrations at Tahrir, or Liberation, Square at the heart of the city, where 10,000 protesters gathered for their first demonstration on Tuesday. The police, backed by armored vehicles and fire engines fitted with water cannon, were also deployed in large numbers at Ramsis Square, another flashpoint in central Cairo. The Muslim Brotherhood said at least five of its leaders and five former members of parliament had been arrested. The group's lawyer, Abdel-Moneim Abdel-Maksoud, and spokesman, Walid Shalaby, said a large number of rank-and-file Brotherhood members also had been detained. The movement's momentum appeared to gather Thursday with the return of Nobel Peace laureate Mohamed ElBaradei and the backing of the Muslim Brotherhood. Social networking sites were abuzz that the gatherings called after Friday prayers could attract huge numbers of protesters demanding the ouster of Mubarak. Millions gather at mosques across the city on Fridays, giving organizers a vast pool of people to tap into. "There is a big gap between what the government says and the reality of people's lives," Nasser Shareef, a 24-year-old librarian, said as he made his way to a mosque in the upscale Mohandiseen district. Violence escalated on Thursday at protests outside the capital. In the flashpoint city of Suez, along the strategic Suez Canal, protesters torched a fire station and looted weapons that they then turned on police. 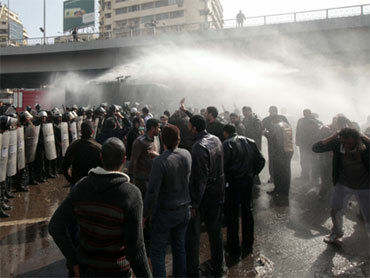 The Interior Ministry said in a statement that more than 90 police officers were injured in those clashes. There were no immediate figures on the number of injured protesters. In the northern Sinai area of Sheik Zuweid, several hundred Bedouins and police exchanged gunfire, killing a 17-year-old. About 300 protesters surrounded a police station from rooftops of nearby buildings and fired two rocket-propelled grenades at it, damaging the walls. On its website, the Muslim Brotherhood said it would join "with all the national Egyptian forces, the Egyptian people, so that this coming Friday will be the general day of rage for the Egyptian nation." The Brotherhood has sought to depict itself as a force pushing for democratic change in Egypt's authoritarian system, and is trying to shed an image among critics that it aims to seize power and impose Islamic law. The group was involved in political violence for decades until it renounced violence in the 1970s. "We're still reaching out to the regime to work with them for the process of change. Every Egyptian doesn't want to see the country going into violence," he said. Its comments were likely to reinforce the belief held by many protesters that Mubarak's regime is incapable, or unwilling, to introduce reforms that will meet their demands. That could give opposition parties an opening to win popular support if they close ranks and promise changes sought by the youths at the forefront of the unrest.